Italian yard Baglietto used this month’s Singapore Yacht Show to showcase its new 55 metre concept, which was developed in collaboration with Milanese studio Santa Maria Magnolfi. Baglietto, historical La Spezia-based shipyard, confirmed for the second year its presence at the Singapore Yacht Show, with the aim to develop the brand in the Far East, an area considered an highly potential market. 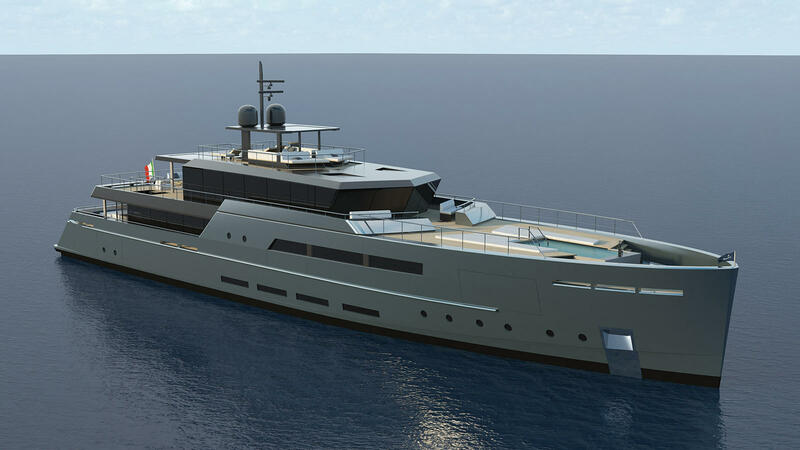 In fact, the V-Line introduced at the latest boat shows, which features displacement and semi-displacement yachts in steel/aluminium and aluminuim, characterized by very contemporary lines and vertical bow, is now enriched by a new 55m displacement project designed by the Milano-based designers Santa Maria Magnolfi. The project presents sheer lines which draw inspiration from Baglietto’s tradition in the military sector. The design is sober and elegant in line with the smaller sistership of 41m presented at the latest Fort Lauderdale Boat Show. The big volumes, both inside and outside, represent the main characteristic of this 55m vessel, yet maintaining the performance which is one of the main feature of Baglietto yachts: thanks to 2 x Caterpillar 3512B HD DITA-SCAC the vessel can comfortably reach a top speed of 16 knots and cruising speed of 12 knots. Also an hybrid version can be provided as Baglietto intends to carry on his renovated commitment in the product innovation looking for new high operative flexible solutions. The exteriors can boast huge common areas which can count on all kind of comforts. The upper deck is more than 280sm wide, in particular at its bow a 6-metre pool is located. Beach club, this extended pool becomes a distinctive feature of this project and a gym and spa are also provided aft with direct access to the sea thanks to a platform. The interiors are wide and generous. The main deck offers a 90 sm open living areas next to the 21sm dining area that can become a private meeting room thanks to some gliding panels. The Owner suite includes a separate office and the terrace that can be open to enjoy the view. A lift connects the 3 main decks while you can reach the under-lower deck from the crew quarters: here spacious cold rooms, storages and laundry are located for an easy life on board. On the upper deck at the back of the wheelhouse there is a huge cinema room which opens to the al fresco dining area which can seat up to 20 guests around the central table. The aft garage hosts a tender of 7.5m in length while the smaller one, jet skis and several toys are located in a second garage at the bow. Five new motor-yachts are currently under construction at the shipyard: while the prototype of MV19 is being completed, a new 55-meter displacement motor-yacht is being produced together with a 43m of Baglietto Fast Product Range and two new 48m displacement line. The first one for delivery next summer to its Owner. Baglietto will be attending the Versilia Yachting Rendez Vous in Viareggio from 11 to 14 May with “Lucky Me” and “Pachamama” of 46m and 43m respectively.